The Xcent is built on the same 2,425mm wheelbase as the Grand i10 and the two cars are near identical right up to the C-pillar. That means everything, like the peeled-back headlamps, slot-like grille, angular fog lamp inserts and thick side strips are carried over unchanged. Even the glasshouse is the same. It’s only the chrome lining on the Xcent’s hexagonal grille and this top-spec car’s larger 15-inch wheels that are unique to the sedan.The tail section doesn’t look like it was tacked on to the rest of the body as an afterthought, as in the case of the Maruti Swift Dzire. Instead, there’s a nice sense of proportion here, with the roof flowing smoothly into the boot, which has a smartly contoured bumper and an attractive lip. If anything, the boot looks a bit too tame, and the well detailed but tiny tail-lights don’t help give it presence either. On the whole, the Xcent looks neat, with styling that’s a pleasing, if slightly subdued iteration of Hyundai’s Fluidic Sculpture design language.Under the skin, the Xcent sticks to the norm with its suspension setup – MacPherson struts up frontand a rear torsion bar. 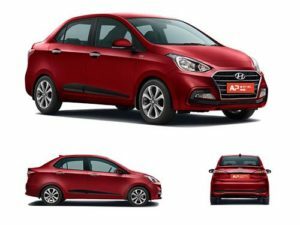 However, Hyundai has stiffened the rear suspension compared to the Grand i10 to deal with the additional weight loads sedans are generally subject to. For the record, the petrol and diesel Xcents are each 15kg heavier than their Grand i10 counterparts. In terms of safety equipment, ABS is standard only on the top-spec SX trims, while driver and passenger airbags come only on the S (O) and SX (O) trims. Moving on to the engine, there is a 1.2-litre Kappa2 engine that produces about 83bhp of power and 115Nm of maximum torque. This is offered with a five-speed manual and four-speed automatic options. At the same time, there is an all new 1.2-litre CRDi diesel engine that churns about 85bhp of power and this comes with a five-speed manual only. This is an all new engine and has an improvement in its power and mileage botThe new Hyundai XCent 2017 comes with a 1.2-litre petrol engine. This produces about 82bhp of power and comes with five-speed manual and four-speed automatic transmission options. This is the same engine like the earlier petrol XCent. There isn’t any change on it. So, we expect the performance to remain the same. This engine is good enough for daily city driving. On the highway it is good enough for cruising comfortably at around 120 km/hThe new 1.2-litre diesel also makes its way into this car. It was earlier launched with the new Grand i10. The best bit about this engine is its refinement. It is extremely quiet and it doesn’t make much noise either. This is one of the most highly refined diesel engines in the country. The power is good enough. There isn’t any kind of turbo lag and the engine has good amount of power and torque delivery too. This comes with a five-speed manual transmission. The gearbox is easy to shift and the clutch is extremely light too. This is what makes this engine such a good bit. The Xcent is a competent car, and it’s well priced too in its class. But, we feel the pricing with respect to the Grand i10 might be a bit of a dampener. The base variants of the Xcent and the Grand i10 aren’t too far apart, but the Hyundai Xcent diesel in SX (O) trim costs Rs 7.42 lakh ex-showroom Delhi, about Rs 1.1 lakh more than the top-end Grand i10. And for that extra moolah, you don’t get a whole lot more. The Hyundai Xcent a nice car to drive and comes fitted with a long list of features and it will also not disappoint you as an overall package. But when viewed with respect to the Grand i10, the Xcent doesn’t make such a compelling case for itself. The marginal extra power on tap isn’t a deciding factor between the two. So, if you are one who frequents out-of-town drives with a full compliment of passengers and need the extra luggage space or want to buy the sedan purely as a status symbol over the hatchback, the Xcent is the car for you.